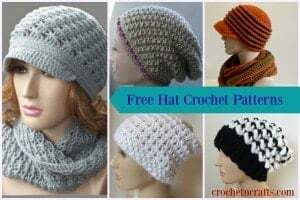 This brim hat pattern is given in one size, however, it can be crocheted into any size hat that you want. You can either make your increases by doing more increase rounds or simply by switching up your yarn and hook sizes… like I did. 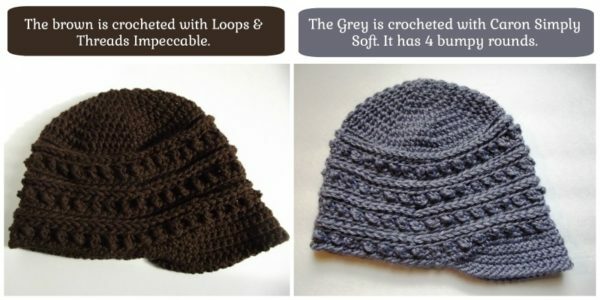 The brown hat that you see pictured was crocheted with Loops and Threads Impeccable yarn and an I crochet hook; and the grey was done with Caron Simply Soft and an H crochet hook. The brown measures an inch wider when laying flat, but both hats are about the same height as I did more rounds on the grey hat. Although it’s a brim hat, the acrylic gets too hot in the warmer weather. 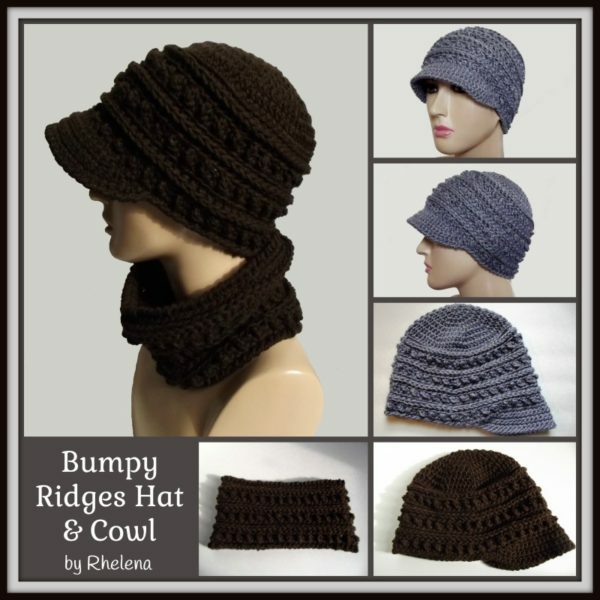 So, if crocheting this for the summer weather, you might want to use a cotton yarn instead. Yarn: Loops & Threads Impeccable or Caron Simply Soft, or any worsted weight yarn. Crochet Hook: I/9-5.50mm if using Impeccable and an H/8-5.00mm for the Caron. Gauge: Over first 2 rnds it measures 1.75″ for the impeccable and 1.5″ for Caron Simply Soft. Finished Size: Laying flat the one with Loops and Threads Impeccable measures 10″ across and 7″ from top to bottom not counting the brim. The one with Caron Simply Soft measures 9″ across and just over 7″ from top to bottom. Rnd 10: Ch 1, blhdc in same st as join and into each st around; join with sl st in both lps of first hdc. Rnd 11: Ch 1, bphdc in same st as join and into each st around; join with sl st in first bphdc. Row 1: Join yarn to 23rd st from where you fastened off. Ch 1, 2 sc in next st, (sc in next 2 sts, 2 sc in next st) 6 times, sl st into next st. Turn. 26 sc. Last Rnd: With RS facing, Ch 1, rsc evenly around; join with sl st in first rsc. FO. With the impeccable it measures 9.5″ across when laying flat, and 5″ high. Crochet it to any length by increasing your starting chains. Ch 60 (or any multiple of 2), join with sl st being careful not to twist chs. Rnd 2: Ch 1, blhdc in same st as join and into each st around; join with sl st in both lps of first blhdc. Rnd 3: Ch 1, bphdc in same st as join and into each st around; join with sl st in first bphdc. Rnd 4: Ch 1, *blsc in first st, bltr in next st; rep from * around; join with sl st in both lps of first blsc. Rnd 5: Ch 1, sc in same st as join and into each st around; join with sl st in first sc. Rnds 6-13: Rep rnds 2-5. Rnd 14: *Ch 1, rsc around evenly. Join with sl st in first rsc. FO. Join yarn to other side and rep from *. Add this pattern to your Ravelry or get the pdf here on Craftsy.